We’re on the move! In so many ways. New America is committed to renewing America in the digital age and in 2015 we lived the mission in several ways. We moved physically, to beautiful new office spaces in New York and D.C.; we moved towards bigger and more innovative ideas; and we moved forward with our initiative to reinvent the think tank. Our 2015 annual report highlights our work to continue doing what we think we do best: collecting data, analyzing and critiquing present laws, regulations, and policies, and proposing new ones. You will see some of our most important achievements throughout this report, but let me preview a few here. The Open Technology Institute played a crucial role in keeping the Internet free and open for millions of Americans by helping to shape, through countless hours of work, the strongest net neutrality rules in U.S. history in Feburary 2015. We helped to lead a broad coalition of industry and civil society groups in favor of net neutrality and were cited extensively in the FCC’s Open Internet Order. Our International Security program continues to provide must-read analysis on the key security issues of our time. Our ISIS in the West report, released after the Paris terror attacks, provided groundbreaking analysis of the thousands of Westerners drawn to join ISIS and other Jihadist groups. Our Education Policy program published two books charting how the full span of education—from birth to adulthood—can better harness technological innovation to teach the skills of the future. Lisa Guernsey’s Tap, Click, Read shows how digital technology can boost children’s literacy, and Kevin Carey’s The End of College presents a bold model of higher education that uses new technology to be more inclusive. 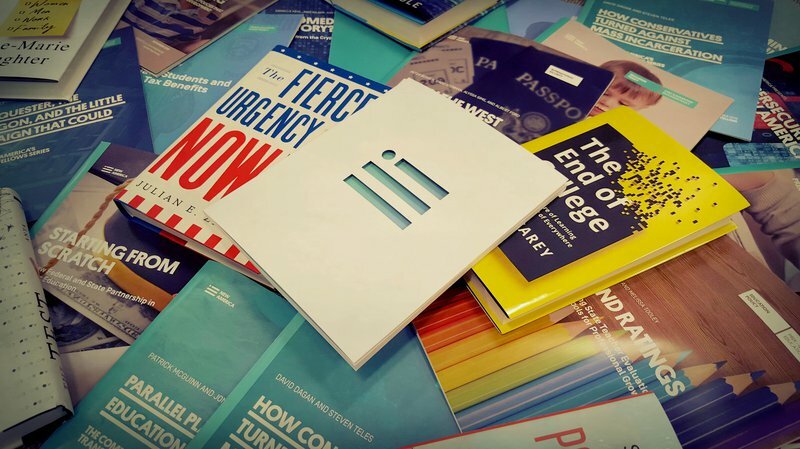 The London-based Prospect magazine awarded us its 2015 U.S. Think Tank of the Year award in the social policy category. On the program side, we moved in many new directions. Our Cybersecurity Initiative, jointly directed by OTI and the International Security program, held its first annual conference in February 2015. February also saw our first Future of War conference, in partnership with Arizona State University, which attracted wide participation from the military services as well as academic and policy thinkers. Several months later we welcomed Byron Auguste and Tyra Mariani as they founded Opportunity@Work, aimed at “rewiring the American labor market” by providing Americans with the skills they need to land well-paying jobs in 35 cities and communities across the country. Our Breadwinning and Caregiving program, now under the baton of Brigid Schulte, renamed itself the Better Life Lab and reinvented its mission through a series of exciting new projects. We launched the Women in Cybersecurity project and watched Bretton Woods II—Tomicah Tilleman’s effort to create a vast pool of capital for global impact investing and development finance—take off! At a deeper level, we are committed to advancing our mission of renewal with innovative policies and practices. Last November OTI senior advisor Ben Scott and I published a Washington Monthly article titled “Rethinking the Think Tank.” We compared the Progressive movement’s vision of technocratic, top-down policy research with a more dynamic and iterative 21st century model of bottom-up public problem solving. To make this vision a reality, 2015 saw us laying the groundwork for the opening of New America CA and New America Chicago, as well as deepening our work at New America NYC. Finally, we have added several new board members: National Review editor Reihan Salam, Fresno Mayor Ashley Swearengin, and New York Times columnist David Brooks. Our founding commitment to political heterodoxy—an institution in which it is not possible to predict our positions from our politics—is stronger than ever. In sum, New America is growing, moving, and shaking. But our core is the same: a fabulous and fascinating group of people committed to a new America. I hope you’ll stay involved by following our experts, subscribing to our content, and supporting our work. Click here to read our 2015 Annual Report.